We all have those card that you use a lot and just don’t belong in you wallet and for those card they made this Doctor Who pass holder. Inside you can store things like your buss ticket, travel card, school ID or maybe your credit card. 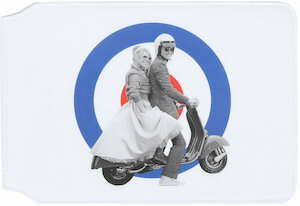 And this travel pass holder is white and shows a black and white image of the 10th Doctor and Rose on a scooter. If Rose Tyler and the 10th Doctor Who are your favourites then this pass holder could be perfect for you. And sure it’s not a replacement for your wallet but I am sure you are going to use it a lot more then you may think. If you need a cool card holder that can hold two cards then this Doctor Who pass holder maybe perfect for you. The outside is Tardis blue and shows the Tardis and the text “Keep Calm I’m The Doctor” and the design can be found on the front and back of the travel pass holder. On the inside you find two pockets that are see through making them perfect for a travel pass and ID but all kinds of things can be stored in it of course. Maybe you want a holder for you credit card and that would work fine to. Many of us have to deal with ID cards all day long to open door or go through security. But that could become a lot easier with this Tardis badge holder. Just hang your ID on the Doctor Who badge holder and you are set to go. The badge holder has a 24″ cord build in that reels easily so that you never have to take the ID card of. 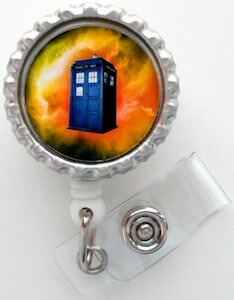 The Tardis badge holder standard comes with a belt clip but alligator / swivel clips are available to. On the badge holder you can see a yellow exploding galaxy and in front of that there you find the Tardis hoovering around in space. No more problems with lost ID cards when you start using this Doctor Who Tardis Badge Holder.